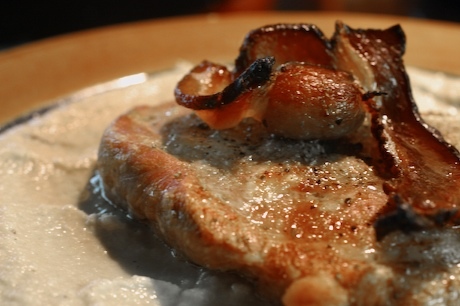 Just like one of those wacky descriptions on a Chinese take out menu, it struck me that if a pork chop tastes good, wouldn’t it taste doubly good with some pancetta or bacon on top? And if roast fennel is delicious, why not add some fennel flowers to it? Ground fennel seed or fennel flowers act as a fantastic flavor enhancer for white meats. By white meats I mean: pork, chicken, pheasant, squab, guinea fowl, quail, any of those little birdies. 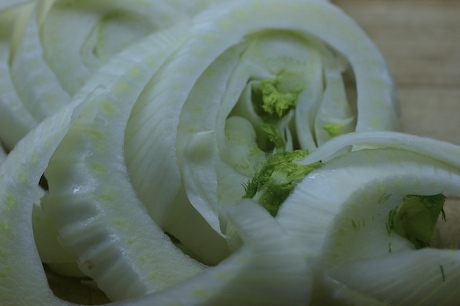 The fennel works as a flavor embracer, it doesn’t stand out on its own, but blends and mutates to complement the meat. Layer the fennel, onion and garlic in a roast pan and roast at 350 for 15 mintues. Coat with a drizzle of olive oil. Turn from time to time to prevent stickage and brownage. Sprinkle salt, pepper and fennel seed onto the pork chops adding the slice of pancetta on top and then place the meats on top of the roasting vegetables. Continue roasting until the pork chops are done and the vegetables are soft, another 12-15 minutes depending on the thickness of the meat. Remove the meat to a warm plate. Puree the vegetables until smooth, adding any pan juices to the vegetable mix, place the puree onto a plate, lay the chop on top. Eat.